Peony problems aren’t that common, as these plants have all the qualities gardeners value most highly in perennials. They have fragrant flowers, are long-lived and easy to grow, cold hardy and deer and drought resistant. But sometimes things can go wrong with peonies. Here are solutions to potential problems. My peony buds start to grow in spring, but they stay very tiny and die. This is a condition called “bud blast” that can occur in newly planted peonies. The flower buds grow about the size of a small pea but then stop growing and fail to open. Peony plants form their buds in the fall. A clump that’s been divided has a much-reduced root system, and it sometimes doesn’t have the strength to develop all its buds. This problem goes away as the plant matures. In more mature plants, possible causes include poor soil fertility, too much shade, dry spells or cold injury after an extreme winter. Winters that are colder than normal and late spring frosts can abort the buds of mature as well as new plants. The best remedy is to protect peony clumps with winter mulch (fall leaves or Christmas tree boughs work well) applied in late fall or early winter after you have cut down the previous season’s foliage. A few stems on my peony suddenly got a gray mold and then wilted and turned brown. What’s wrong? In cool wet springs, peonies can be affected by botrytis blight. A number of stems in a clump can be affected in older plants, while young plants can have all stems affected. You should remove any wilted stems, cutting below the affected area. Be careful not to allow diseased material come into contact with healthy stems. Discard in the garbage (not the compost), and disinfect your pruners with rubbing alcohol or bleach. Your peonies should recover when conditions get drier and warmer. To prevent problems, always plant your peonies in a sunny spot, spacing them to allow for good air circulation, and do a good clean-up of old leaves each fall. More information about fungal diseases on peonies. I’m having peony problems: my plants have been in the same spot for years, but now they aren’t blooming as well as they used to. 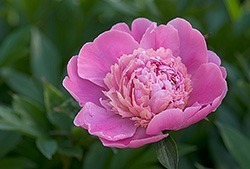 Generally, peonies grow well for many seasons, as long as they have humus-rich soil, adequate moisture and full sun. However, if your plants have been in the same spot for years, the soil may be depleted. Mulching them each spring and fall with a couple of shovels full of well-rotted manure or garden compost can help. If your plants are getting crowded or are now shaded by surrounding trees and shrubs, consider dividing or moving them. The best time to do this is in late summer or early fall. Cut into the fleshy roots to make divisions that have at least four or five eyes (the little buds you see on the roots). Replant into enriched soil and make sure the eyes are set no deeper than two inches. See tips for improving your soil. Should I worry about ants on my peonies?